1. Special holiday bottles and cans. Look for soft drinks sold in spooky containers. Last year, Crush soda had three Halloween flavors -- Gruesome Grape, Spooky Strawberry and Orange Ogre, that came in limited edition plastic bottles with scary faces, perfect for Halloween parties. And Jones Soda had two limited edition Halloween flavors, Caramel Apple and Blood Orange, in cans with portraits of a zombie and a vampire. Fanta is also known for its Halloween packaging. 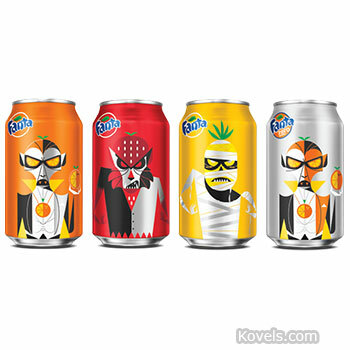 Pictured is this year's Fanta, advertising wickedly delicious "flavors that thrill." If you saved those cans, good for you! Enjoy this year's Halloween soft drinks – it's a special occasion – and keep the bottles and cans. 2. 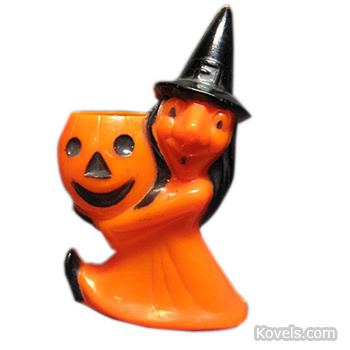 Plastic "stuff" – colorful 1950s and '60s candy containers, figures, and jack-o-lanterns are inexpensive and easy to find. Look for hard plastic holiday-themed candy containers made by the E. Rosen Co. of Rhode Island, also known as Rosbro Plastics and the School House Candy Co. The candy containers are no longer made, but they're charming and plentiful. Keep an eye out for contemporary plastic decorations with good design. Enjoy the candy – and keep the containers. 3. Zombies and vampires. There was a time when Halloween wasn't about REALLY scary things like zombies and gruesome headless monsters. But tombstones and skeletons aren't spooky enough anymore – since zombies and vampires became popular TV and movie creatures. 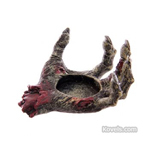 Look for plastic, rubber, or resin decorations like the zombie-hand candleholder. Scare guests now – and save for later. 4. Jewelry. 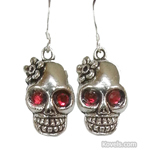 Charm bracelets with pumpkins, bats, and black cats; jointed skeleton earrings decorated with rhinestones, and spider rings of all kinds are fun and easy to find. Wear now – and save for later. 5. 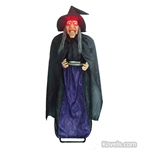 Motion- or voice-activated figures that light up or emit scary sounds and music. Have you ever jumped out of your skin when a fake witch screamed, crept, or crouched when you walked past? Life-sized pumpkin men, witches, vampires, black cats – even just body parts like crawly hands – can be found in any degree of "fun scary." Startle neighbors now – and save for later. And save the paper or plastic masks, costumes, treat bags, and dolls as low-priced future collectibles to enjoy each October. Check out our Pinterest Halloween Board and watch Terry Kovel discuss her favorite Halloween collectibles on YouTube. Article originally appeared on October 23, 2014 and updated on October 24, 2018. If you leave a soda can long enough the soda will evaporate and you will have an empty can. If you use the pull tab, empty it, rinse it and bend the tab and top back into place it will not lower the value. Beer can collectors for many years opened the bottles from the bottom with a can opener. Almost every package should be emptied of food or drink or rust or insects will cause damage. Condition is more important than anything. Terry Kovel. I never leave the food or beverage inside. With the cans (or bottles) I simply rinse clean and ensure they are dry before storing. If you leave something like soda in the container, you risk leakage and possible corrosion to the container --- not to mention the nearby surroundings. I never know what makes the soda can more valuable -- Should the liquid be left in the cans or should it be drained before storing as a collectible? Everyone knows that the soda (or any food item in a collectible container/box) will eventually go bad, so is it good to empty the container, keeping only the empty can/bottle, or should the contents be kept, sealed and intact? I have full sets of the Richard Petty Pepsi bottles, still containing the soda. Since I know by now the soda is no good, I wonder if it can be drained for easier storing. I don't want to lose any possible future value by draining them if I should leave the soda sealed up.